The Maritime Aquarium at Norwalk offers visitors of all ages the opportunity to have a good time while learning about the vital natural resource just off their shore: Long Island Sound. Visitors explore at their own pace, observing 34 exhibits featuring more than 1,200 marine animals of 259 species. These close encounters with animals, enhanced by friendly volunteer interpreters and informative display panels, educate visitors about the aquatic life of Long Island Sound and its watershed. The sharks, seals, river otters, sea turtles and other animals, carefully tended in re-created natural settings, serve as ambassadors both for their species and the Sound's natural environment. The Maritime Aquarium also boasts Connecticut's largest IMAX Theater, with a movie screen that's six stories high. 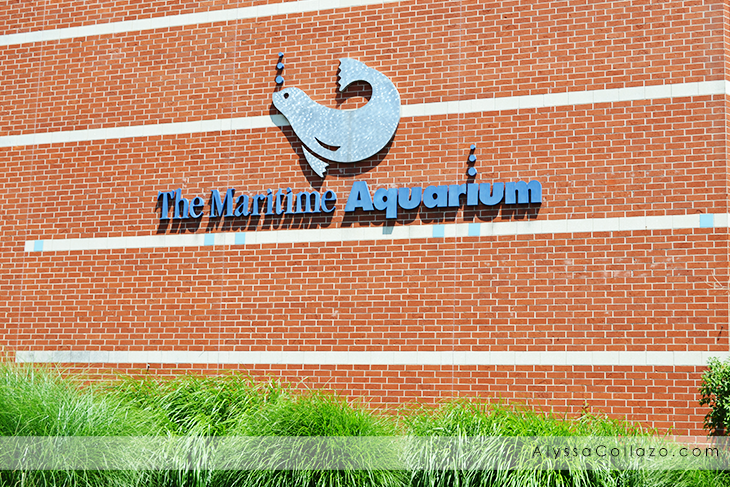 My family and I had the chance to visit The Maritime Aquarium at Norwalk. 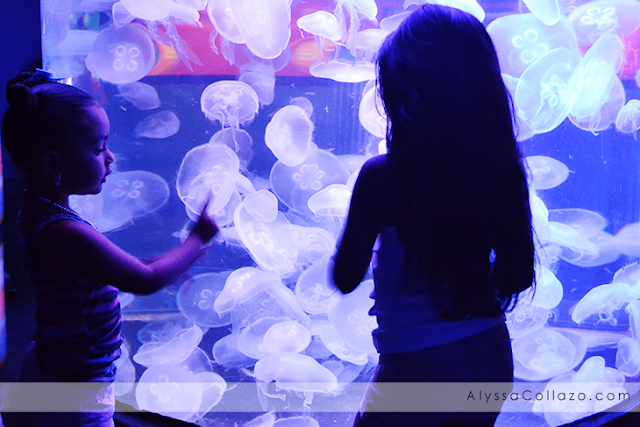 The first thing we did was visit the Jiggle a Jelly: Touch Exhibit. It was pretty awesome doing something you've been told not to do all your life: touch a jellyfish! This fun display lets you safely touch live moon jellyfish, a common local species whose stings are generally benign to people. My oldest daughter absolutely loved this exhibit and so did my Fiance. Not only were they able to touch Moon Jellyfish but they learned so much about them. After the Jiggle a Jelly: Touch Exhibit my daughters noticed the Shark and Ray Touch Pool. 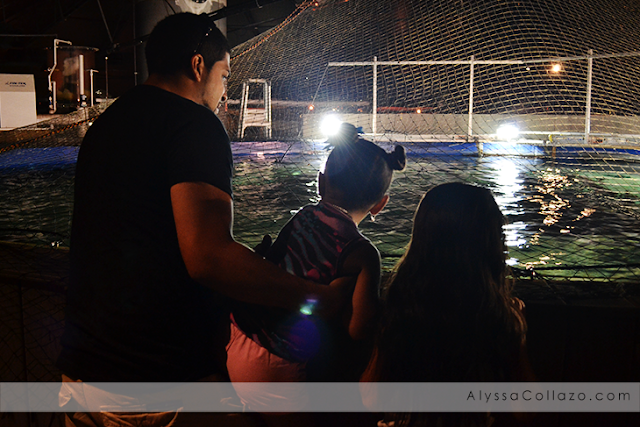 This wasn't our first time touching Stingrays but we usually have to pick them up, as some Exhibits are a little high. Not this Touch Pool. It was perfect for them. The touch pool has a side window, plus an underwater viewing window for kids. Next, we made our way to the Frogs Exhibits. 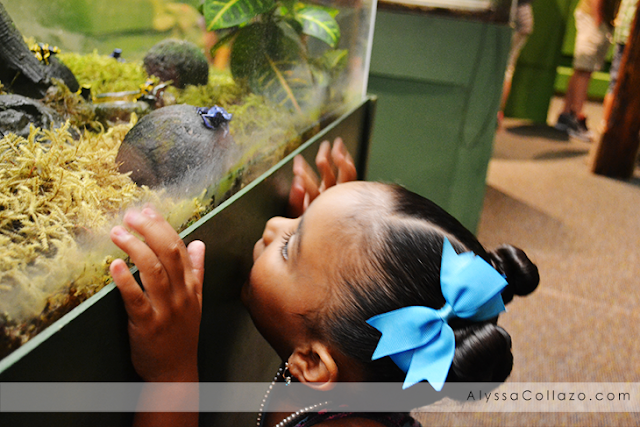 These cool exhibits feature dozens of species of frogs, toad and other amphibians from around the world! My youngest took a lot of interest in this exhibit. It was fun to watch her explore and learn about all different kinds of Frogs and Toads. After having lunch at the Cascade Café, we had the chance to enter the "Flutter Zone". The exhibit features hundreds of exotic tropical butterflies of dozens of varieties from Asia, Africa and South America. 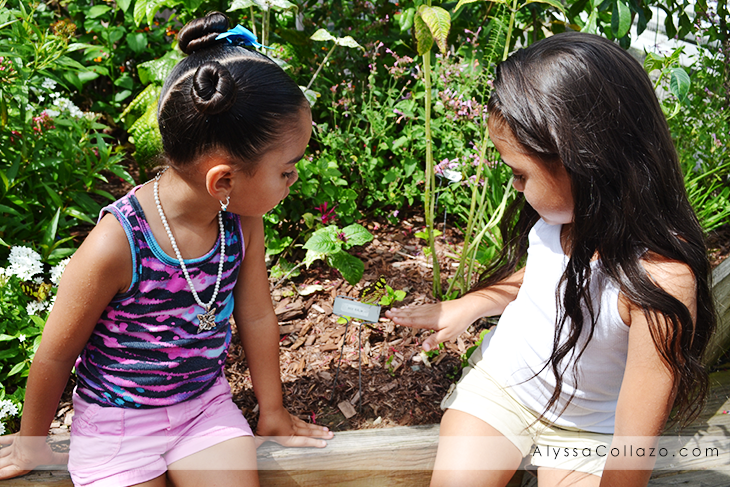 During our walk through the Flutter Zone a butterfly or two chose to land on us. While I'm not a fan, it was pretty cool. Plus, Entry into “Flutter Zone” is free with Aquarium admission!! Everyone gets to enter a Magical environment. 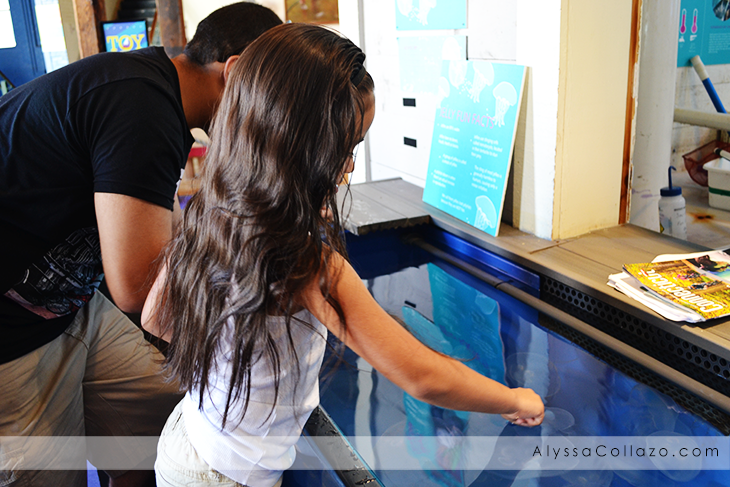 Before leaving we decided to visit the Marine Lab which featured my daughters FAVORITE exhibit, Jelly Fish (Jellies). Jellies are fascinating and soothing to watch; in The Maritime Aquarium's display, they're like a living lava lamp. Now, I want to talk about our experience at The Maritime Aquarium's IMAX Theater, we had the chance to watch Great White Shark on a screen as tall as a six-story building! We absolutely LOVED the movie and learned so much about the Great White Shark. The 40-minute film takes viewers around the world to great-white hotspot! At first my daughters were scared but by the end of the film they wanted to learn more. 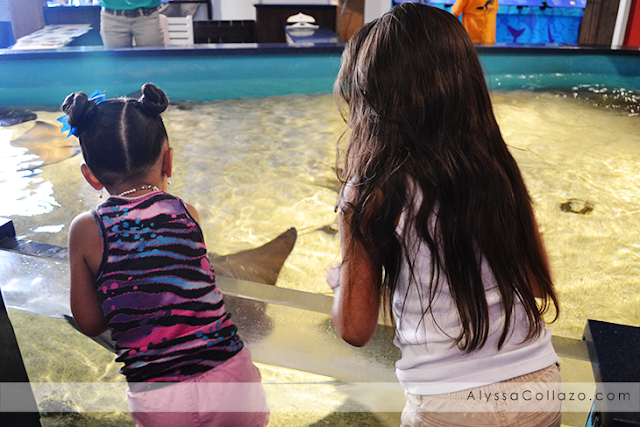 Overall, we had a wonderful time at The Maritime Aquarium at Norwalk and of course we plan on visiting again. Our visit was very educational but in a kid-friendly way. They offered tons of activities which were decently priced from $1- $5, you can't go wrong. Also, If you are local, make sure you check out their website for more information on their Public Cruises, Passengers must be over 42" tall! DISCLAIMER: The Maritime Aquarium at Norwalk provided complimentary passes to their Aquarium. All opinions stated are my own and are not influenced by any affiliates. I love aquariums. I think they are not only educational, but very pretty to look at. I love seeing all the pretty fish. From what you are telling me about this one, the prices seem very reasonable. I would love to visit here someday. Looks like a fun and relaxing place to go with the kids. My kids always love going to a maritime park. That looks like so much fun. I've always loved aquariums. I just find ocean life so fascinating. I love aquariums! (I also like IMAX theaters!) If I'm ever up that way this is a place I will definitely stop in and check out. My kids and I love to visit different aquariums. Our favorite creatures are the jellyfish and sea horses. I love to watch the jellyfish and seahorses when I visit an aquarium. I haven't been in a while. You've inspired me to revisit one of my favorite places. What an amazing aquarium! I love how up close and personal you can get with everything there. I know both of my kids would love this experience! What a cool way to learn more about sea life. I would make sure not to miss the IMAX presentations. I absolutely LOVE that picture of the jellyfish and your girls! I'm hoping to get one like that of my kids when we visit the aquarium next week! That is do cool that you got to touch the sting rays. We got to touch them at Sea World. Plus, I caught a few when I was fishing in North Carolina coast. They would take the bait and get caught on the line. They were tough to real in. For a minimal cost, that was really a great activity you had with your children. I love aquariums too. They are so calming! I loved the jellyfish tank. They are really pretty creatures. Can't say the same thing about frogs though. I love going to aquariums. My husband and I took my daughters a couple years ago. I love all your photos, especially the jelly fish. I think they're so neat to see! The Maritime Aquarium at Norwalk looks like an amazing place. My kids love to go to the Aquarium and look at all the fish. my favorite is the Jelly fish. Aquariums are a fantastic way to spend the day. I would love to visit the one in Norwalk. Omg aquariums are seriously the best!!! My disgusted has a blast ever time we take her to one! We have a great aquarium in our state. But I love to travel so I need to check out the one in Norwalk and put it on my bucket list. I have always found jellyfish to be so fascinating! I have never visited an aquarium before, but it's definitely something I'm hoping to do sometime soon. What a great place to visit. I like taking my kids to maritime parks. They love watching the sea animals. Aw the children look like they had an amazing time at the Aquarium! We have one here its really popular! This looks awesome! My son would totally love it there. It looks like the kids had a blast. The Maritime Aquarium at Norwalk looks like a great place to visit as a family outing. It is also a place the kids can learn about marine life. The flutter room looks amazing. Thanks for sharing. Wow, that place looks amazing! I would love to take my family there one day. Looks so fun. My kids would love this place! Hopefully, i can bring them here some day! We want to take our kids to a big aquarium yet this summer. They will love it, and even if they don't, I will. We have an aquarium in my city and I just LOVE it! This looks so fun! May I also add that I love those two pigtails in your daughters hair. SOOOO CUTE!